I don’t often post reviews here, but QT Luong’s Treasured Lands is a book I thought you should know about, and QT is currently having a sale on signed copies. 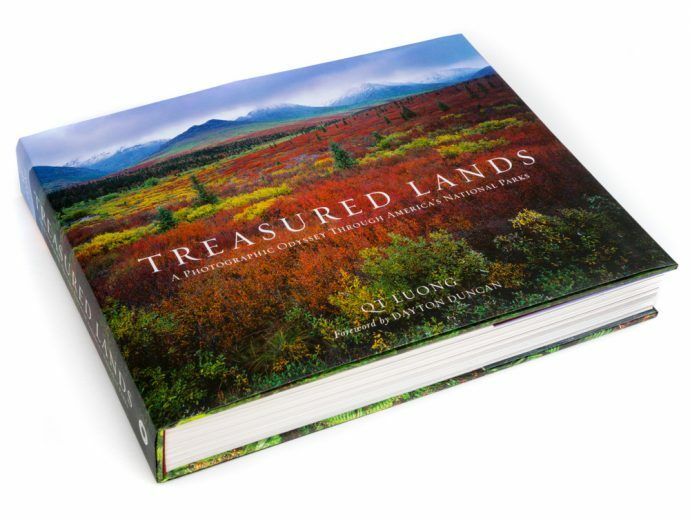 Treasured Lands is a big, beautiful, coffee-table book with photographs of all 59 U.S. national parks. Just visiting all 59 parks would be quite an achievement, but to make artistic photographs of all these places in different seasons and varying weather conditions is an amazing feat. It’s not surprising that it took QT twenty years to accomplish this. 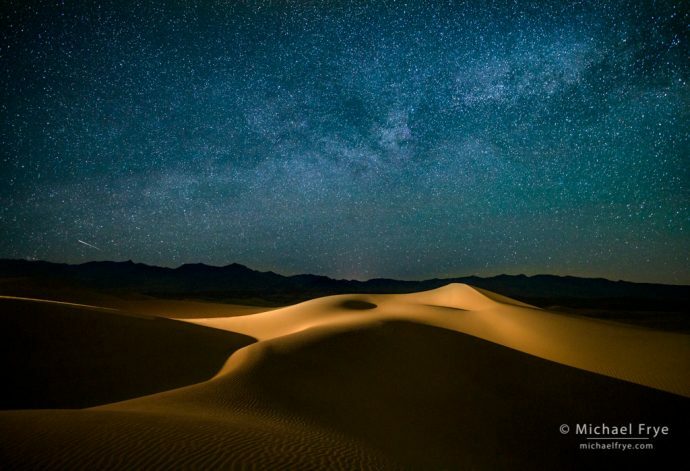 Milky Way over sand dunes, Death Valley. I was puzzled by talk about the “star-eater” issue with Sony cameras, since all my nighttime photos made with my a7R II showed plenty of small stars – including this image made in April from Death Valley. There’s been a lot internet chatter lately about the so-called “star-eater” issue with Sony cameras. If you haven’t heard of this, last August Sony issued a firmware update for the Mark II versions of all its full-frame E-mount cameras (a7 II, a7s II, and a7r II), and many people have reported that since then these Sony models have been making smaller stars disappear in nighttime photographs. It seems that the new firmware included some kind of noise-reduction algorithm (even with Raw files) that blurred or eliminated those smaller stars. And, unfortunately, there’s no way to revert these cameras to the previous firmware version. In June of this year Sony released new firmware updates for these models, but some initial reports indicated that this new firmware didn’t fix the “star-eater” issue. A Cure for Soft Lenses? In my recent post about high-resolution cameras, I stressed the importance of sharp lenses to get the most out of these 36+ megapixel sensors. But lens sharpness is an issue with any camera – at least when you start making larger prints. Even with a 16- or 20-megapixel sensor, lenses make a significant difference in large prints (16×20 inches and up). This is especially true in the corners; most professional-quality lenses are sharp enough in the center (at least with middle apertures like f/8 or f/11) for even a 36-megapixel camera. It’s the corners and edges that separate the decent lenses from the great ones. Those great ones are hard to find, and tend to be expensive. Wouldn’t it be nice if you could fix imperfect lenses with software? Well yes, of course. But my experience with such fixes hasn’t been good. I’ve seen some great before-and-after examples online showing a blurry photo fixed with software, but when I’ve tried those programs myself I’ve invariably been disappointed. These cures tend to be just more-sophisticated sharpening methods, which may help a little, but if you apply more than a small amount things get really crunchy, or you see other weird artifacts. I can usually do just as well by selectively adding more sharpening to the corners in Lightroom or Adobe Camera Raw. A few months ago I stumbled across another program that promised to help with fuzzy images, called Piccure+. I decided to download the free trial, and found that it worked surprisingly well. 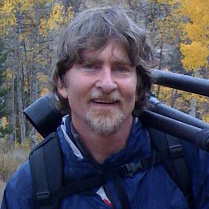 It’s not a magic bullet; there’s really no substitute for sharp lenses. But it can help with those soft corners, or overall softness caused by diffraction. Like any of these tools, it will definitely make the image look too crunchy if you overdo it, but I’ve been able to push the sharpening effect further in Piccure+ than with other software I’ve used, with good results and minimal artifacts. 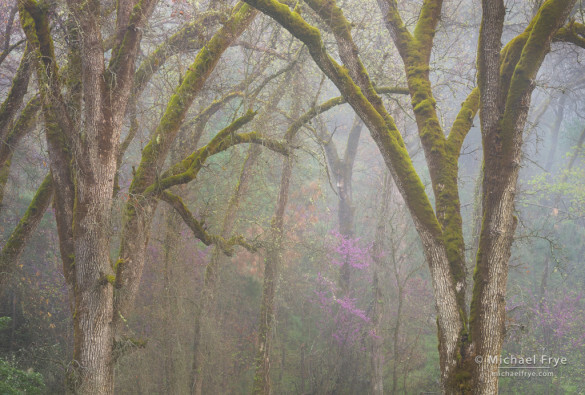 Oaks and redbuds in the fog, Mariposa County. A sharp lens, good technique, and the 36-megapixel sensor on my Sony A7r captured an incredible amount of detail in this photograph; I’ve printed it up to 40×60 inches with great results. I’ve been getting a lot of questions lately about Canon’s new 50-megapixel cameras, the 5DS and 5DS R. These models haven’t been released yet, but many Canon users are wondering whether they should upgrade. Since these cameras aren’t available for testing yet, it’s hard to say anything definitive about them. But since I bought my 36-megapixel Sony A7r over a year ago I’ve learned a lot about working with high-resolution cameras, and some of those lessons might be relevant to people who are considering buying one of those new Canon models, or a 36-megapixel camera like the A7r, Nikon D800, or Nikon D810. 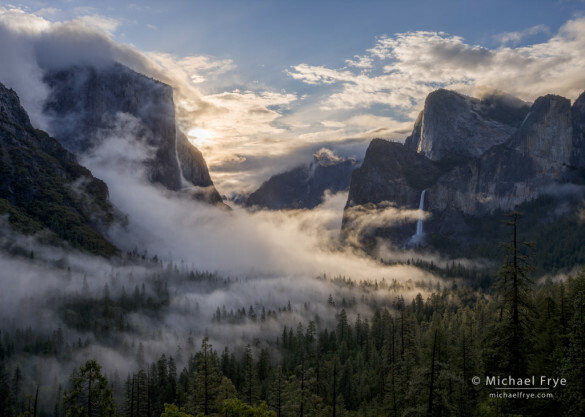 Swirling mist from Tunnel View, Yosemite. The new HDR Merge in Lightroom 6/CC did a great job with this high-contrast scene, producing a natural-looking result, and doing it with a completely non-destructive workflow. 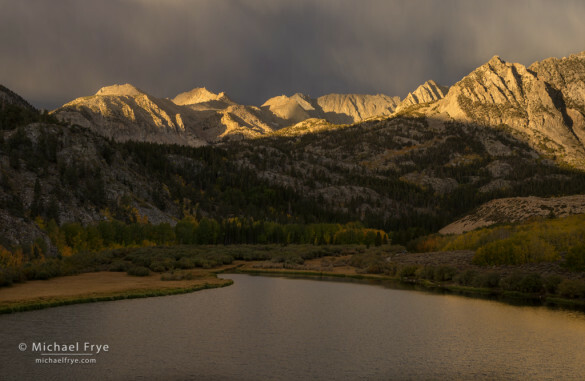 After months of rumors, last week Adobe finally released Lightroom 6 and Lightroom CC. When I saw the list of new features, I have to say I was a bit disappointed. 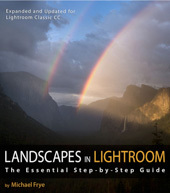 I was hoping for improvements to Lightroom’s retouching tools, and to the Adjustment Brush. It would be nice to add a curve to only part of an image, for example, and the Auto Mask function of the Adjustment Brush has long needed improvement. Alas, Lightroom 6/CC offers only small improvements to the Develop Module, like the ability to move and copy Adjustment Brush pins, and to modify Graduated Filter and Radial Filter selections with a brush. Nice, but hardly earth-shattering. Should Your Next Camera Be a Sony? 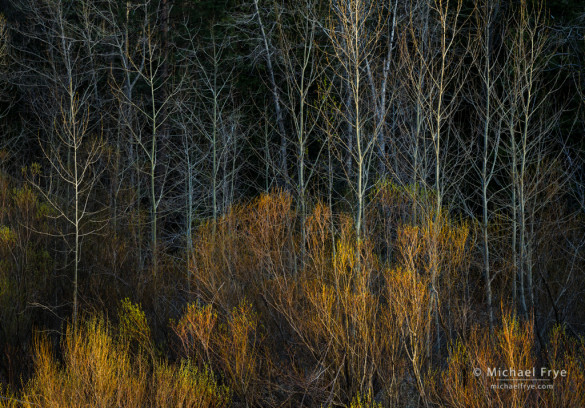 Willows and cottonwoods in late-afternoon light, Yosemite. The outstanding resolution of the Sony A7r allowed me to make a 40×60-inch print that captures all the fine detail of this image. I don’t review or even talk about equipment very often, but I reviewed the 36-megapixel Nikon D800E last summer because I think it’s such an important, game-changing camera for landscape photography, with exceptional resolution and low noise. Like many Canon users, I’ve been waiting for Canon to offer a competitor to the D800 and D800E. Rumors keep circulating about a 40-megapixel Canon camera, but so far nothing more substantial than a rumor has appeared. Then last fall Sony announced their new full-frame, mirrorless Alpha A7 and A7r cameras – the A7 with 24 megapixels, and the A7r with 36 megapixels. The A7r uses essentially the same sensor as the Nikon D800E (though Sony says they’ve improved it). For a Canon user like me, the A7r was intriguing because some readily-available adapters could be used to mount my Canon lenses on it. The short distance between the sensor and the A7r’s lens mount makes it possible fit an adapter between Canon or Nikon lenses and the camera, and still be able to focus at infinity. So I could potentially get the resolution and noise control of the D800E without having to make a large investment in new glass. And the A7r seemed reasonably priced at around $2300 (though adding an adapter and battery grip brings it close to $3000). But I had some big questions. The A7r is a mirrorless camera, so would I miss a real, optical viewfinder? How well would my Canon lenses function with the adapters? And what about “shutter-shake,” and other potential problems that I’d read about online?